So I was rooting for Efron to be better than I thought he was. He plays Richard Samuels, a high school student in 1937 who is enamored of acting, the theater, singing and art. We see him for a moment at school, studying the 16th century, before the movie lets him loose in Manhattan, where he quickly meets an aspiring writer, Gretta Adler (Zoe Kazan, granddaughter of Elia), at a music store. She’s even more enamored of art than he is—she has that solipsistic quality peculiar to artists: forever lost in her own mind—and she’s trying to get a short story into the already hallowed pages of The New Yorker. Outside the music store she talks of a writing teacher who would critique her work by waggling his hand back and forth and saying, “Possibilities,” and, just before the two part, she, forever thinking like a writer, says, “Wouldn’t this be a great scene for a story? Two people meeting like this and no more?” Richard waggles his hand back and forth. “Possibilities,” he says. It’s a nice scene, but it lays open the Efron problem. Richard doesn’t have that artistic/solipsistic quality. Gretta is deeply into what she wants. But what is he after? The film wants Richard to be an observer to the unfolding events—the chaotic manner in which a theatrical masterpiece is created—but he doesn’t have the nothing quality of a mere observer. His position is small and tentative yet he moves like someone who’s used to being center-stage. He follows Orson but not sycophantically. He spends time with Sonja Jones (Claire Danes), who works in the office while calculating how to meet David O. Selznik, and he flirts with her, sure, but he doesn’t seem to set his sites on her until the other actors in the troupe, adults all, act jealous that he has entré with the woman they’ve dubbed “The Ice Queen.” He takes things for granted but not in the way the young take things for granted. It feels off. There are nice moments. We worry how he’ll do with this role he’s lucked into, and during first rehearsals he says his line (“Here is the man who would speak with you”), exits incorrectly, then correctly, then breathlessly asks a guy backstage how he did. “I cried,” the guy dryly responds without looking up from his magazine. But the nice moments don’t add up to a whole. His family worries about the hours he’s keeping but nothing comes of it. He’s falling asleep at school but nothing comes of it. He takes Sonja out to dinner, runs into Gretta again, follows Orson to a radio broadcast. Eventually he sleeps with Sonja at Orson’s place. At first he seems nonchalant, then nervous, then petrified. He’s obviously never slept with a girl before, and Efron pulls it off, but this knowledge clatters among everything else we know, and don’t know, about Richard. His parts don’t add up to a whole, either. “Tell me who you are,” Sonja asks at one point. Yes, please. McKay, by the way, is astonishing. He not only offhandedly sounds like Welles, he displays the energy and fierce intelligence that Welles often displayed onscreen. When his eyes light up with an amused, thick-as-thieves look, I thought: Harry Lime lives. Then there’s opening night. Welles is backstage, soaking up the waves of applause, and says to no one in particular, “How the hell do I top this?” A second later you see his mind begin to work on that question. We already know the answer but you get the feeling he doesn’t—yet. That’s how good McKay is. 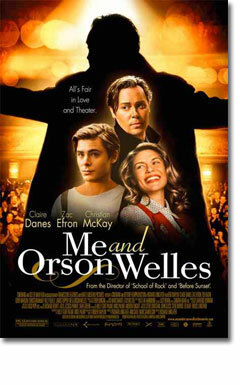 “Me and Orson Welles” is, as I’ve said, a fun movie, but at times it has an artificial, hurried quality that I associate with latter-day Woody Allen. It’s if the characters are less characters than puppets to be moved around the stage to make the point the author wants to make. Events feel externally rather than internally driven. Yet it’s not without its poignancy. At the end, Richard runs into Gretta again, and she thanks him—not enough—for helping get her story published in The New Yorker. The two, flush with their momentary successes, talk creativity and art. “It feels like it’s all ahead of us,” she says, and it was, then, 70 years ago. But we know their successes, if they have successes, will be small and short-lived, even as we know Welles’ successes will be big and short-lived—in the sense they lead, not to another “Citizen Kane,” but to Paul Masson commercials in the ’70s and “Transformers” voiceovers in the ’80s. In her earlier story, the word “possibilities” is pejorative to both to her and her writing teacher. By the end, seeing these people in a moment before things play out, one feels the sadness of choices made; and one appreciates the beauty of possibilities.